12 was a majority decision victory in favor for Pacquiao, yet many boxing observers felt Marquez was the rightful winner. Their first 2 fights were also controversial. In 2004, Marquez fought to a controversial draw despite suffering 3 first-round knockdowns to Pacquiao. 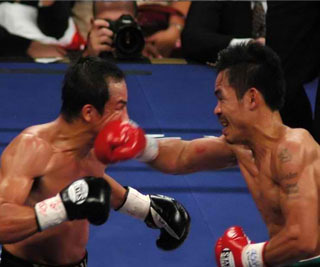 The Mexican suffered another knockdown and lost via split-decision to the Filipino during a closely fought rematch in 2008. Juan Manuel Marquez added that if a fourth fight between Pacquiao does materialize, he hopes that it will not be held in Las Vegas, where he feels judges and officials are biased in the Filipino's favor. Other matter that Bob Arum will also discuss are other options for Pacquiao. Marquez is just 1 of the 4 possible opponents for Pacquiao. Other boxers on the short list are Timothy Bradley, Lamont Peterson, and Miguel Cotto.